Forty-six kids are diagnosed with cancer every school day, and less than 4% of cancer funding from the government goes to childhood cancer research. Run for kids fighting cancer to help us find better treatments with fewer long-term side effects and, ultimately, a cure for childhood cancers! 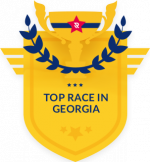 We are a Peachtree Road Race Qualifier! The Rally Cupid Chase 5K is a USATF Certified course, which means you can submit your time when you register for the 2019 Peachtree Road Race for a better start wave placement. *When registering online through Active.com, prices listed above do not include the processing fee charged by Active.com. No refunds will be allowed. Event will be held rain or shine. Arrive early, we may have a lot of race day registrations. Although we will accept credit card payment, check or exact cash will expedite your registration process. Registrations taken after Jan. 15, 2019 cannot guarantee shirt size. Friday, Feb. 8, 2019 | 10 a.m. – 6 p.m.
Saturday, Feb. 9, 2019 | 6:30 a.m. – 7:30 a.m.
Cupid Chase 5K – The main event. Run 3.1 miles in celebration of Valentine’s Day. Cherub Chase 1K – Get the kids running early! This fun event is for ages 8 and under. Parents are welcome to run with children – the distance is approximately 0.62 miles. All Cherub Chase participants will receive a shirt and goodie bag. Catch Cupid – If you are looking for a real challenge, try to beat our Cupid to the finish line. If you beat our Cupid, you will be awarded an additional prize. Costume Contest – If running in a costume is your thing, then dress up like Cupid and be entered to win some great prizes that you are sure to love! Stroller 5k – Think pushing 50 extra pounds is tough? Bundle your little lovebugs up, and push yourself (and the stroller!) to the limit in this year’s Stroller 5k division. You’re in a league of your own now, first three strollers across the finish line will receive an award. Spirit Runner – Want to support Rally but not run? Become a phantom runner for $35 and receive a race shirt, race bib and finish line chocolates. A spirit runner does NOT participate in the race and will receive their race shirt in the mail after the event takes place on Feb. 9, 2019. 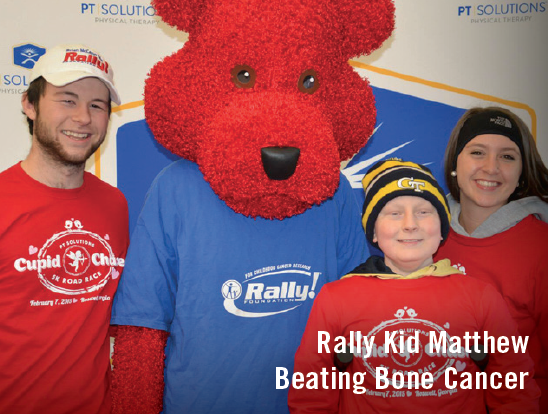 Each spirit runner registration will allow a $25 donation to Rally. All 5K participants receive a race shirt, chip timing and race goodie bags – plus plenty of post-event food and healthy snacks to refuel!